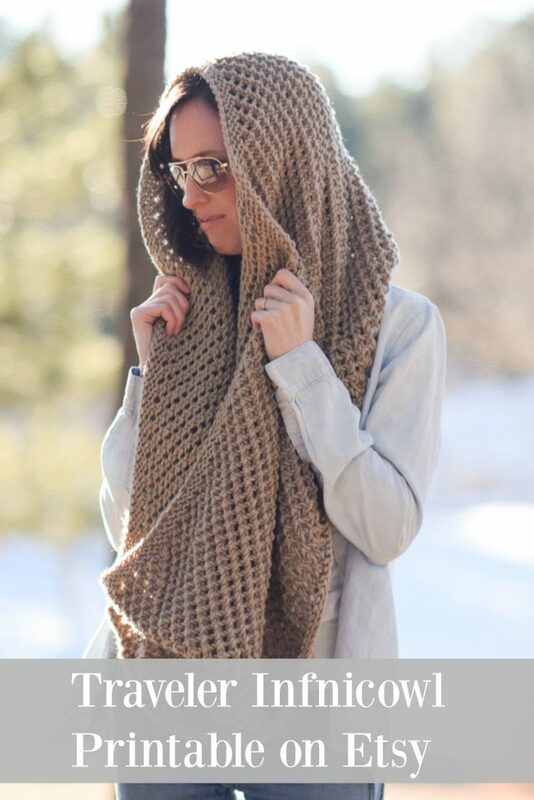 This big, luscious scarf was created as part of the design process of the “Easy Knit Blanket Sweater” pattern. I love the stitch and thought it would be awesome for the blanket sweater, but it turned into this “Traveler Infinicowl” knit scarf instead. Isn’t the color just beautiful? 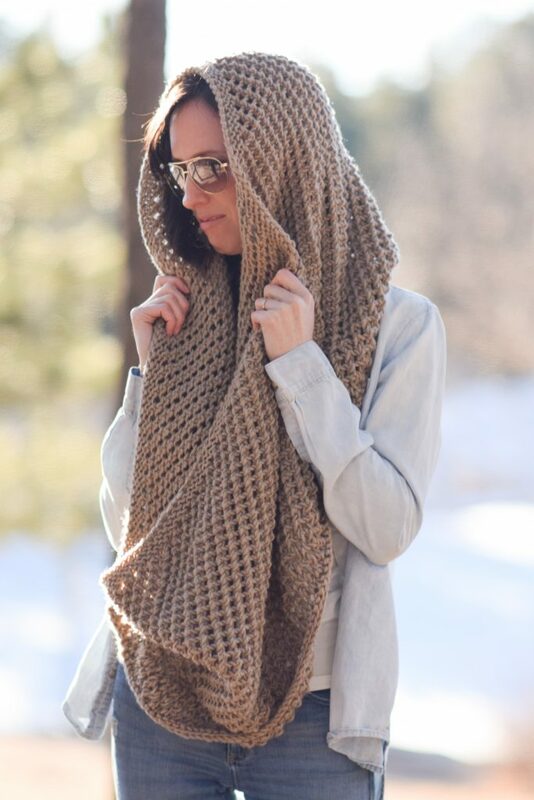 I love this soft taupe that goes with just about anything. Small yarns are so elegant, but sometimes a chunky yarn really makes the stitches pop as is the case here. 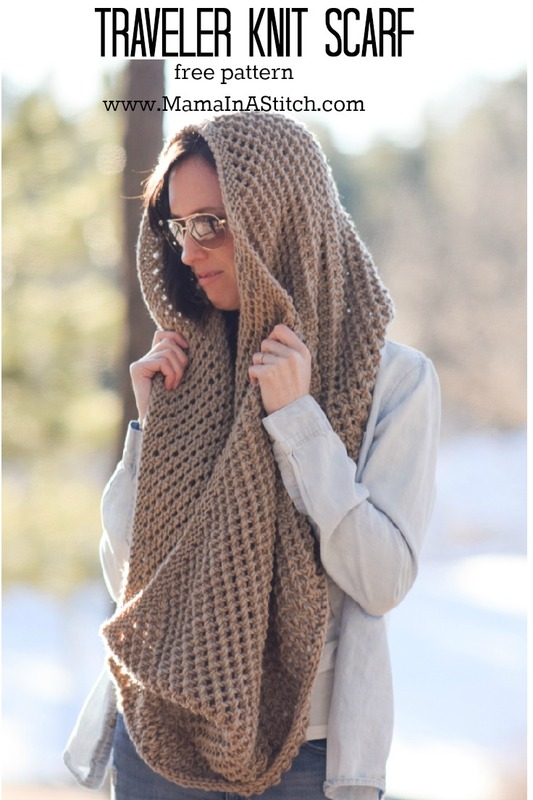 I love how this scarf is wide enough to lift over your head when the wind starts to kick up. Maybe it could be classified as a snood for that reason? 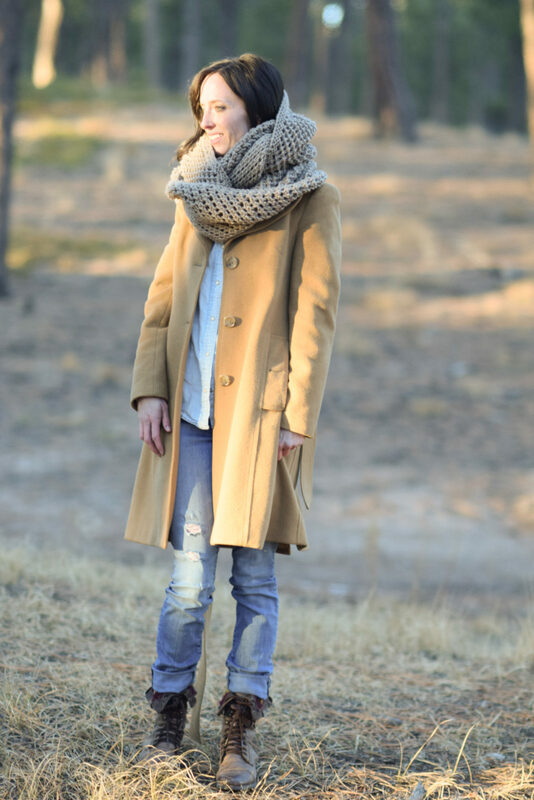 It’s called the “Traveler Scarf” because I think the versatility of wearing it up, down or all around makes it a cozy choice to wear while your travelling by foot. It’s pretty big to pack in your carry-on for the airplane, but if you will be walking through the cold, this will be a welcome accessory. While the stitch pattern is simple, the project itself is not as quick and simple as those that I often post. If you’re up for just a bit more of a challenge, I think that you will be really happy with how this stitch works up! You have to keep track of your rows to an extent, and it’s fairly large. It’s made on US Size 11 needles rather than the biggies which I typically use, so it’s slower going. There’s a bit more work and time involved with this project, but I think it’s well worth it! Okay, are you ready to knit this?? The Traveler Infinicowl Scarf uses a beautiful and mesh stitch pattern that creates a feminine, cozy texture when done with the chunky yarn. 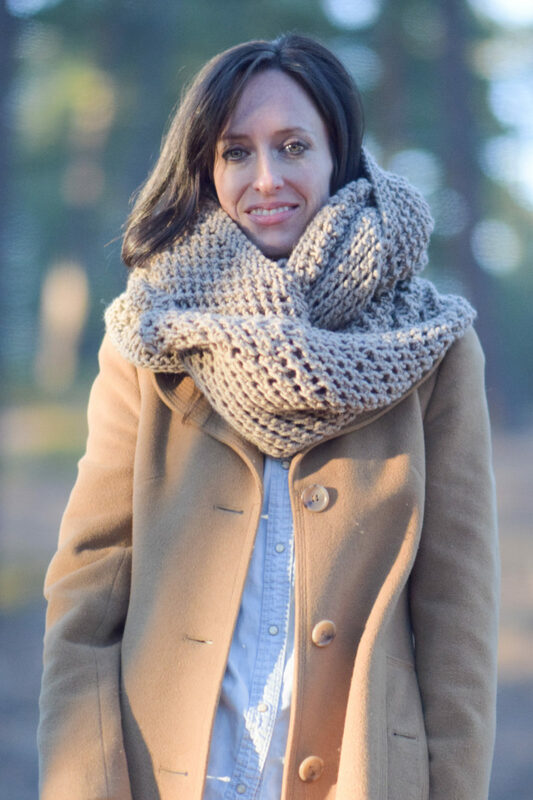 (You might remember that I used this mesh pattern in my Summer Vacation Knit Top Pattern) This chunky knit infinity scarf is made by knitting widthwise (bottom-up), rather than lengthwise. *Please refer to the notes section below to see how you can make a nearly identical scarf by knitting it with the more common method, from end to end. You can find the free pattern below (keep scrolling), or you can purchase an inexpensive, printable, ad-free version from my Etsy Shop HERE. Thank you so much! Approximately 60” inches long before seaming. 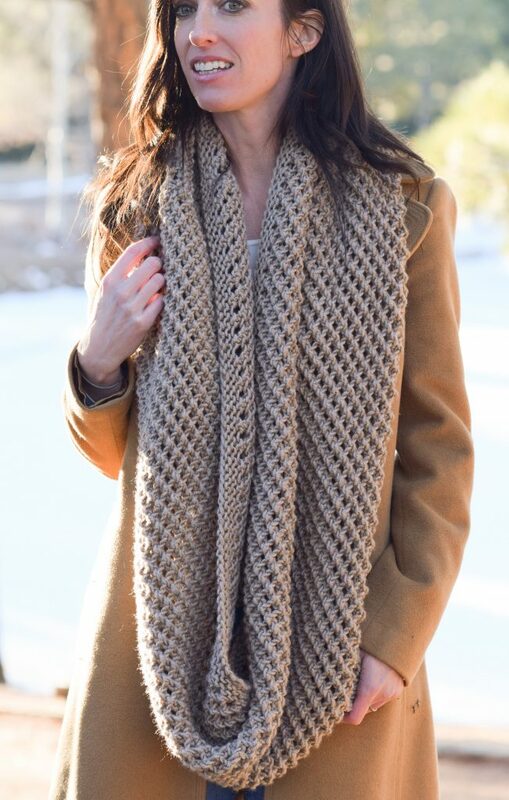 Top to bottom of infinity scarf/cowl is approximately 16” inches in length. This project is worked flat, in rows, bottom-up on circular needles to accommodate the length. 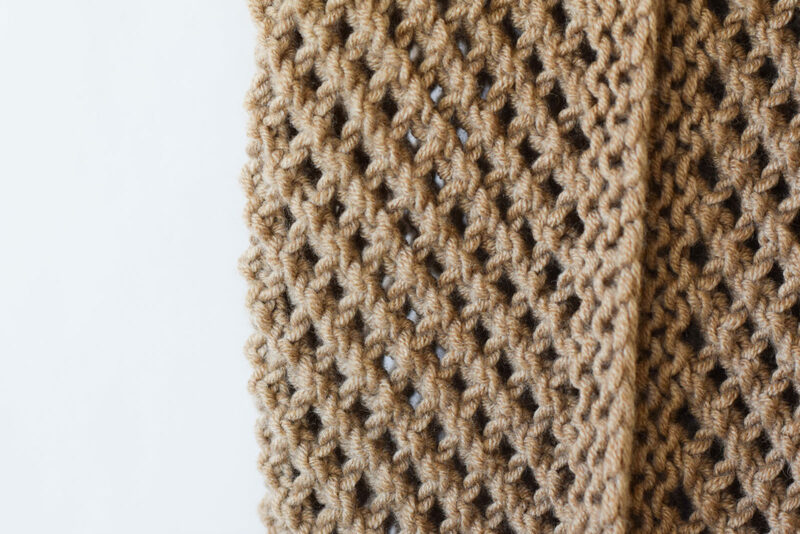 This scarf is worked from the bottom-up, much like how a cowl is typically knit. You then seam the the ends together. However, if you’d rather knit this with the more common method by knitting from end to end, see my note below. 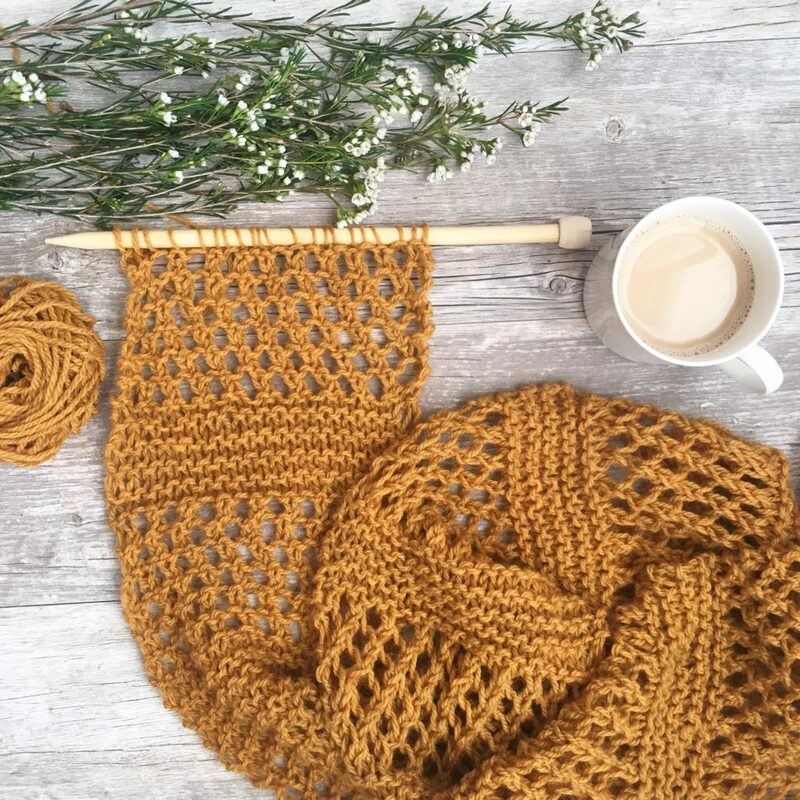 **To work the scarf lengthwise, end to end (as is more common when knitting scarves), cast on an odd number of stitches such as 37 stitches, rather than 143 stitches, to US Size 11 knitting needles. Omit the first and last four rows of knitting, but otherwise follow the pattern until your scarf measures approximately 60” inches long. Follow the same finishing instructions. **Also, I believe that this could be done in the round. 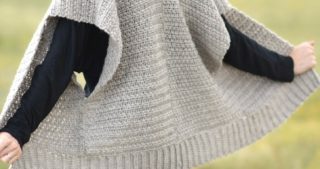 For the first and last four rounds, you would need to alternate a knit round with a purl round to get the garter stitch edge. That would be the only modification that I can imagine you’d make. There’s a couple of reasons that I didn’t make this pattern in the round. One of them being that when I was a new knitter, doing anything in the round really freaked me out. I do love knitting in the round now! However, I know there are some newer knitters that like to knit flat – whether it be hats, fingerless gloves, etc. The other reason this isn’t knit in the round is simply because of the way it began in the design process. It started with the idea of it being knit flat to possibly turn into a blanket sweater. I changed this, and thought it would make a cool scarf. For this reason, I stuck with it as it had been started which was knit flat. Row 8 K2, *yo, k2tog*, repeat from * to * across row to last stitch, k1. Repeat rows 5-8 until piece measures approximately 15 inches from cast on edge. Finish with 5 rows of knit stitch. 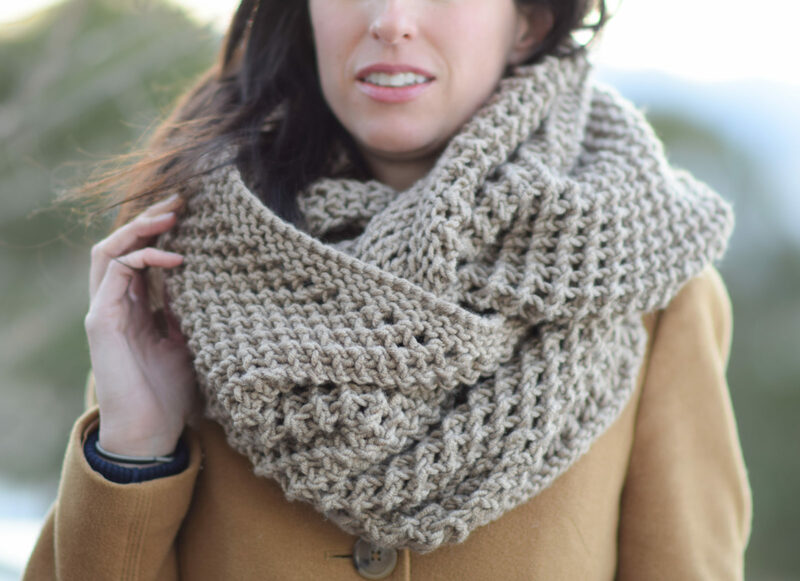 Fold in half to join short ends in order to sew both ends together and make this into an infinity scarf! With a length of yarn and your tapestry needle, seam with a whip stitch or your preferred seaming method. I hope that you enjoy this cozy infinity scarf! Have you attempted knit mesh before? I think it’s quite simple and looks much more complicated than it is. Happy, happy knitting to you my friend! 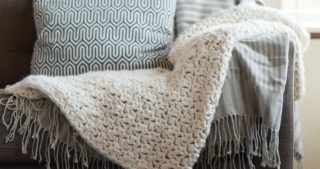 I am a crocheter through and through…. but this beautiful stitch makes me want to pick up some knitting needles! Beautiful! Hi Chrisandra! It is a great stitch and I’m so glad that you like it. I think you could get a similar look with crochet, don’t you? Gaaaa This is gorgeous! I just love your stuff! Your patterns are very unique and hip. (does anyone say that anymore? ) On my list of things to do! Ha ha! How sweet of you! I’m so happy to hear that you think that my patterns are hip. I don’t feel super hip most days, so it’s good to know that I can at least put out hip patterns now and again. 😉 Thanks for making my day Denise. Have a great one! 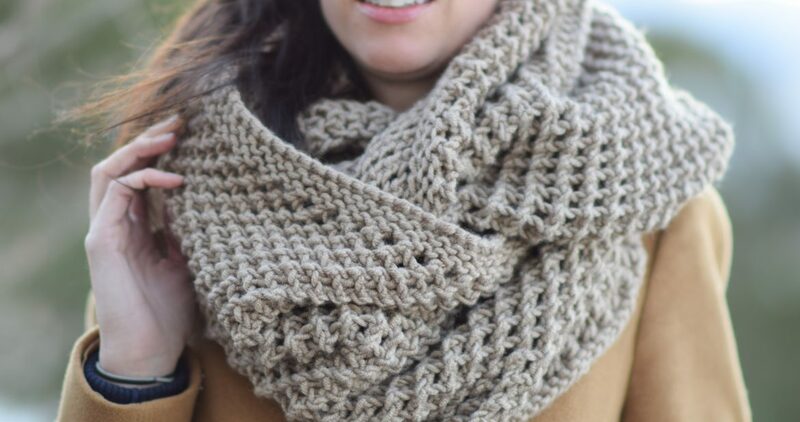 Could you make this scarf in the round without a seam? I just love your designs!! I wondered that too Kathy ! Hi Deb! I just wrote an answer about knitting it in the round, so check it out in the comments section. 🙂 Thanks so much! Yep, you can! I’ve answered how in the comments section as I’ve had this question a lot! I’m also adding it to the pattern above! Thank you! I am more of a crocheter buyback can knit some I saw in the list of skills ‘purl’ but didn’t see in the directions where to purl. Did I miss something? 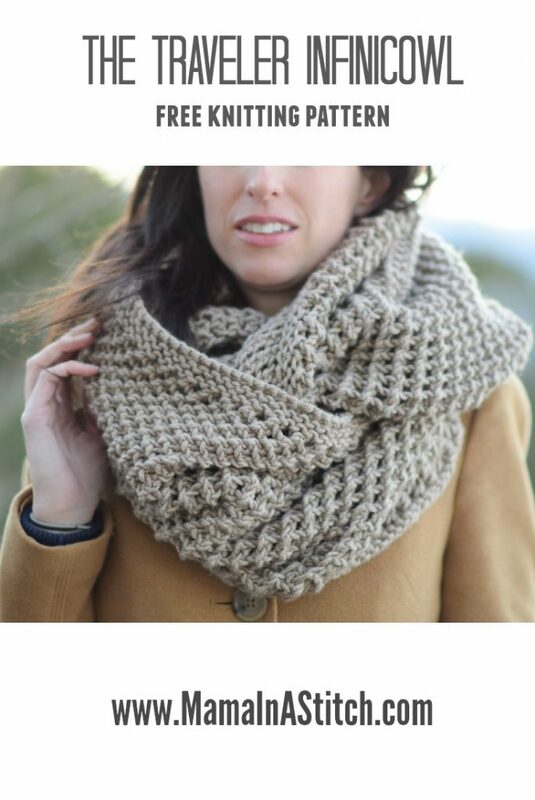 Can’t wait to try making this scarf. It looks gorgeous! Thanks for pointing that out Sheralyn! I missed that when I was going back to edit the pattern. There isn’t any purling and I made the correction. Your patterns are wonderful, so creative! I really love your style. I’ve just answered about knitting this in the round to someone else, so check it out the comments section! It definitely can be done! Merry Christmas and thanks so much for taking the time to ask and to write me, and for following me for a long time. 🙂 I really appreciate your kind words about the blog and patterns! It means so much to me. My best to you and your family this holiday season! Hi-new fan here. I love your style and patterns. 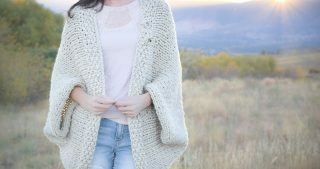 I recently made your serenity shawl and easy blanket sweater, each came out great. This scarf might be next on my list. Happy Holidays! Happy holidays to you and thanks so much for taking the time to write me! Wow, this is a true beauty. Thanks for sharing and I hope one day soon I will actually be joining you with my needles in hand! I’m going to try this knitted in the round alternating the knit and purl rounds, purling on the 6th and 8th rows. I’ll let you know if I like the way it turns out. That is absolutely gorgeous!!! What a stunning pattern, thank you so much for sharing!! I love the look of this scarf also. I just finished making a scarf in the traditional way for my granddaughter for Christmas and really wish I had seen this pattern first. Its beautiful. I have the same question as Kathy and Deb and Delia………..why bother with a seam if you’re knitting on round needles? I thought that the purpose of knitting in the round was to avoid seams? Also, I don’t want to make this as long, so if I read your instructions properly, I can do this by casting on an odd number of less stitches. Is that correct? I can’t wait to start this project. Thanks. 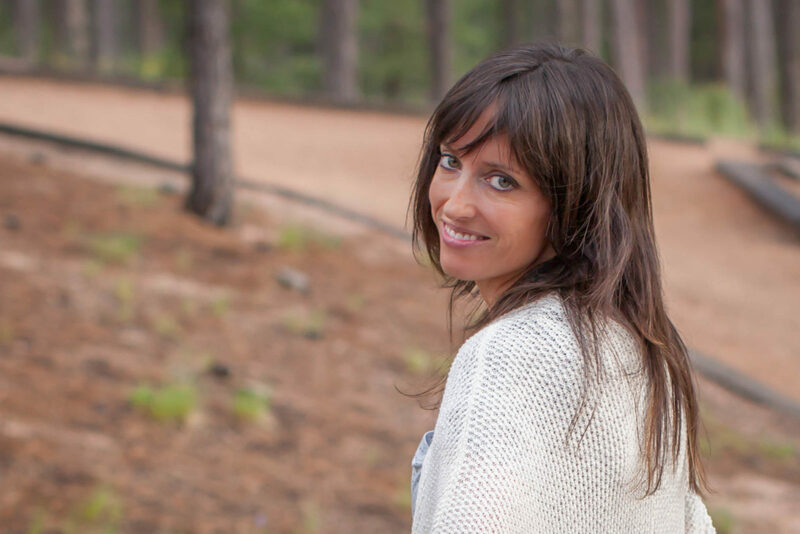 Thanks so much for your question and it’s a good one. I will add what I write below into the pattern above! First, yes, this could be done in the round. For the first and last four rounds, you would need to alternate a knit round with a purl round to get the garter stitch edge. That would be the only modification that I can imagine you’d make. There’s a couple of reasons that I didn’t make this pattern in the round. One of them being that when I was a new knitter, doing anything in the round really freaked me out. I do love knitting in the round now! 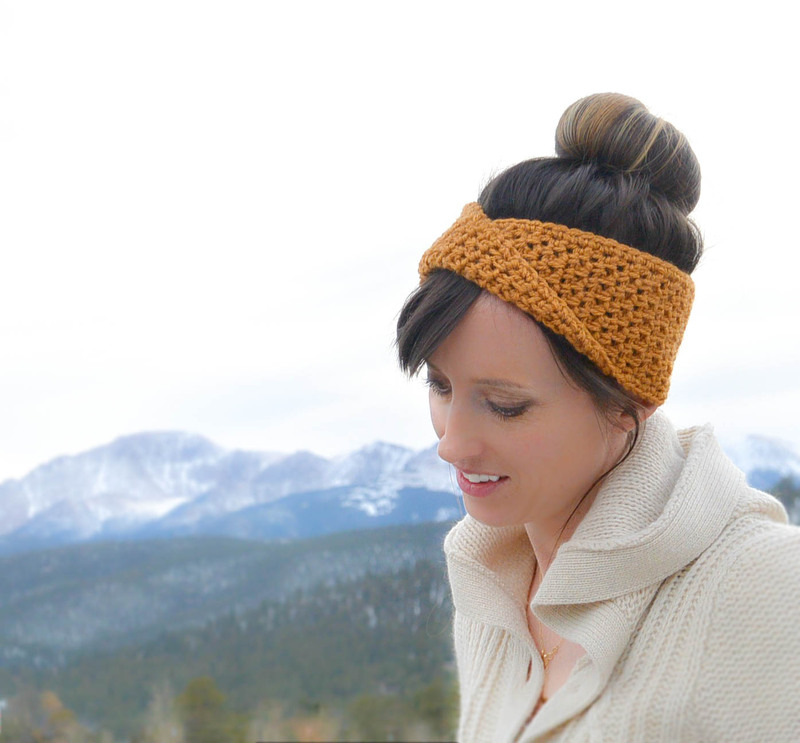 However, I know there are some newer knitters that like to knit flat – whether it be hats, fingerless gloves, etc. The other reason this isn’t knit in the round is simply because of the way it began in the design process. It started with the idea of it being knit flat to possibly turn into a blanket sweater. I changed this, and thought it would make a cool scarf. For this reason, I stuck with it as it had started. SO, feel free to knit this in the round if you’d like, or flat and seamed. Thanks for all of your thoughts and feedback as always! Would you have to change the knit rows in the mesh patterns to purl rows when knitting in the round, or doesn’t it matter? I have thought and wondered about that, but haven’t tried it. I do know a friend who has knit this mesh pattern in the round without purls and it turned out nearly identical. Hey Jessica! I saw this and immediately fell in love. This is so pretty! Help! For som reason mine is not turning out right is there a way to post a pic on here so I can get some advice? The pattern looks good it’s just that as I knit the piece is slanted on one side. I am not knitting in the round. This is so pretty! Like almost everything else on this blog, I can’t wait to make this! If I want to lengthen or shorten this, do I just make sure I have an odd number of cast on stitches? I saw this pattern and decided I had to do it immediately! I wanted to make this in the round, though. As I was making it, I realized that I was creating a seam. I couldn’t fix this no matter how many times I ripped back and restarted. Finally, I decided to cast on an even number of stitches, and ignore the K1 and K2 at the beginning of the 6th and 8th rows. This eliminated the seam. It looks great so far, but I’m wondering if, by casting on even, I’m eliminating a design feature. I am an avid fan of knitting in the round. How many cast on stitches would you recommend if knitted in the round? My best guess would be to keep the same amount of stitches and simply join and knit in the round. This pattern takes multiple skeins is yarn. What method and at what point in the pattern do you recommend joining the new skein? I plan on knitting the pattern as written and flat. Hi Adrienne! I like to join at the end of a row, but it’s all personal preference really! I hope that you enjoy the pattern! I have loved this scarf since you first posted. However, I would love to use the new touch of alpaca yarn which is a bit thinner than the yarn you post here. Would I just decrease my needle size to use this? So go from size 11 to 10? Thank you for your reply. I look forward to working on this. I love this so much, I am designing a market bag to match. I’m gonna call it my Pike Place Market Bag! Thank you so much for all these free patterns. I get yelled at for buying yarn, so I need free patterns. Love this pattern! However, as I knit one side is coming out slanted. I am following the pattern exactly as written. Any advice to fix that? Or is it supposed to turn out that way?